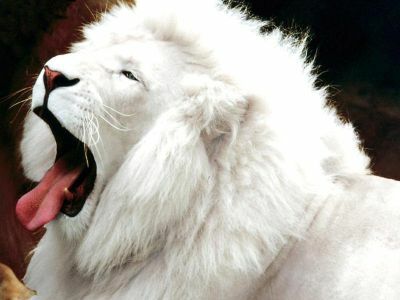 The white lion is occasionally found in wildlife reserves in South Africa and is a rare color mutation of the Kruger subspecies of lion (Panthera leo krugeri). It has been perpetuated by selective breeding in zoos around the world. White lions are not a separate subspecies and they have never been common in the wild. Regarded as divine by locals, white lions first came to public attention in the 1970s in Chris McBride’s book The White Lions of Timbavati. The greatest population of white lions is in zoos where they are deliberately bred for color. The population of the white lion is unknown but the most recent count was in 2004 and 30 were alive. 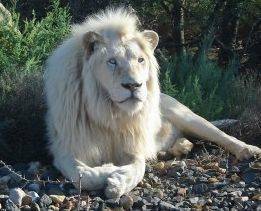 White lions are not albino lions. Instead, the white color is caused by a recessive gene known as chinchilla or color inhibitor. They vary from blonde through to near white, however some can also be red. This coloration gives white lions a distinct disadvantage in nature because they are highly visible. This gives them away to their prey and makes them an attractive target for hunters. 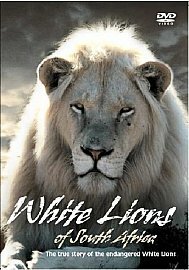 According to Linda Tucker, in “Mystery of the White Lions – Children of the Sun God” they are bred in camps in South Africa as trophies for canned hunts.